Inspired by orinocou's Final Fantasy VI comic and her other artworks featuring Terra. Finished version of this sketch, which you all liked so much that I decided to go ahead and finish it. Gorgeous! 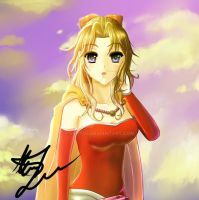 Terra is my all time favorite Final Fantasy character and this is magnificent! Her beautiful smile, bright eyes, and luxurious curls are only the beginning of the greatness of this wonderful piece! Her dress is beautiful and I love how it incorporates her normal color palette. Truly, epic! I still don't have the time I wish I could have online, but I'm definitely going to fave more stuff in the future. Just glancing through your gallery, I see you like a lot of the same characters as me. Thanks for the compliments! Terra is my favorite Final Fantasy character too, and one of my favorite characters of all time. Her questions about her own identity, her "How will I know which way is right?" and "Hope...how could anyone put their hope in me?" resonated strongly with me and have stuck with me over the years. It's interesting that you use the word "luxurious" to describe her curls, because for much of human history, the time and resources to get dressed up all fancy and do your hair were exactly that: a luxury. The Imperial Banquet isn't the kind of event that comes along just every day, and I figure Terra and the other participants would take the time to look good for it. I'm glad to hear that we like a lot of the same characters. Thanks for taking the time to browse my gallery, and thanks again for the fave and comment on Terra here. Sorry for the late reply. I never have enough time to be online and I have to use a public computer which doesn't help either. I love how Terra goes form a blank slate to a very deep character. She starts as an Empire puppet only to eventually help bring that empire down. I like how she is a girl between two different worlds because of her parents. I also like how she sees herself in the orphans and gives up everything to stay with them but when they are attacked she realizes the only way to keep them safe and preventing more empire orphans, like the children and her self, she has to go and end the cause of the problem. At least, that's how I kind of saw it. Sorry, for the mess, but I'm a sloppy writer with muddled thoughts. No worries; as far as I'm concerned there's no such thing as a "late reply" between e-friends, and your thoughts didn't seem muddled to me at all. Those are actually several of the things that I like about Terra too! It always resonated with me that Terra finally finds love not in romance, but in caring for the orphans in a burnt-out husk of a town. And unlike many instances of love in fiction, her love does more than just give her warm and fuzzy feelings--it impels her to overthrow a nihilistic god-despot. I find a lot of admirable traits to emulate in Terra, though I will probably never be half mystic beast. Oh my goodness- this came out stellar! Love the color scheme. And you are very skilled at doing curls, like individually defined curls. The way I make 'em is so messy. This is really beautiful. But on the other hand, taking the time to draw out each individual curl would be incredibly time-consuming for a comic, and not a very practical hairstyle for Terra to maintain either. But I expect she'd have time and impetus to style her curls for the banquet. Thanks for the fave and all the compliments! If you need me, I'll be over here staring at my feet and blushing furiously. That's true. For projects where you have to draw the same person a bunch of times, like comics or animation, its a plus to have a character design that's a little more simplified. And that's what makes it all the more special when characters pull out all the stops for the fancy events. I guess that's true in real life, too. Do you think they taught Terra how to style her curls while she was living in the Empire? I like to imagine she had help from one of the Returners. Someone from their group must have styling skills, I'm sure of it. Int. IMPERIAL PALACE in VECTOR. TERRA stands before a mirror, hands planted on the dressing table. Her HAIR RIBBON sits on the edge of the table. Her hair is a mess. She bows her head and closes her eyes. Mouth drawn tight, TERRA furrows her brow--then abruptly relaxes. She opens her eyes. I remember how to style my hair. It is strange how there's this whole silent period of Terra's life. We know nothing about what it was like growing up in the Imperial capitol, whether she was treated well or if she had a spartan childhood or what. I wonder if her childhood had any influence on her affection for the orphans of Mobliz, if their desolated state reminded her of her own lonely upbringing. Did we just get a little piece of fanfiction? I think we did. I always wondered about her upbringing, too. She comes out of vector in that red dress that she either picked herself or someone picked for her. Which points to the likelihood that she was treated like an individual, not just another soldier in uniform. Good point--that's a reasonable inference to make. I wonder if Kefka was authorized to use the slave crown and then test her abilities against fifty Imperial elites, or if he just went ahead and did that with no approval like he did with the poisoning of Doma.